Mr. Trump has done little to hide his excitement about that prospect. The White House has even issued a commemorative coin for the meeting that depicts the two men, in profile, facing each other, and refers to Mr. Kim as the “Supreme Leader.” But inside the White House, one official said, there was confusion about what will happen on June 12 — or whether a meeting will happen at all. Mr. Trump said he detected a change in Mr. Kim after he met China’s president, Xi Jinping, this month in the coastal Chinese city of Dalian. He suggested that Mr. Xi, whom he described as a “world-class poker player,” encouraged Mr. Kim to harden his approach to the United States, in part to gain leverage in trade negotiations between China and the United States. The threatening words between Pyongyang and Washington have also raised the pressure on Mr. Moon, who has acted as a kind of go-between for Mr. Trump and Mr. Kim. His diplomacy set the stage for the Singapore summit meeting, and he has urged Mr. Trump to push for a historic breakthrough with the North, saying that such an achievement would make him a candidate for a Nobel Peace Prize. Turning to Mr. Moon, Mr. Trump asked him whether he believed that Mr. Xi was influencing Mr. Kim. Mr. 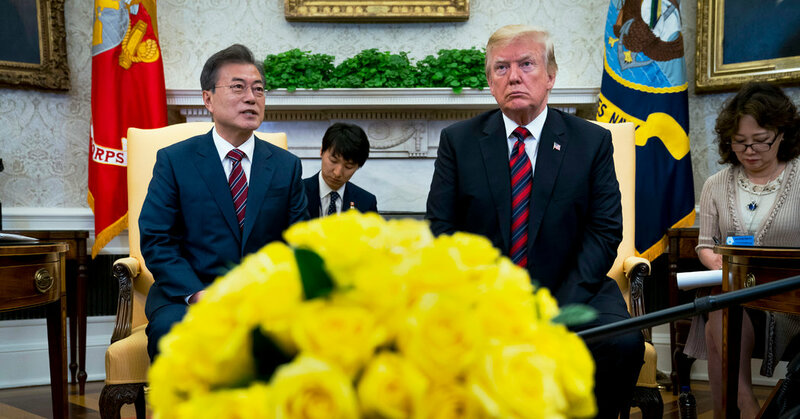 Moon deflected the question, though he conceded there was skepticism in the United States about the prospects for a successful negotiation. He said Mr. Trump’s participation set this process apart from previous ones. Though Mr. Moon’s visit had been scheduled for weeks, Mr. Trump called him on Saturday, ahead of his visit, suggesting the depth of uncertainty he feels about the harsh words from Pyongyang. North Korea objected particularly to John R. Bolton, Mr. Trump’s new national security adviser, who said recently he viewed Libya as a template for negotiating the denuclearization of North Korea.